NBA players and owners came to their senses during ten-hour settlement talks Friday, and will advance a tentative agreement to their respective memberships for approval. No, the lockout’s not over, not yet. But the lawsuits will be withdrawn, the players’ union will reform, and approval of the deal is expected from all parties. Many reports cite “significant concessions” by the owners. Whether that happened is highly suspect, considering that objective observers at Yahoo Sports, The New York Times and CBS Sports had weeks ago decided that the divisive issues were relatively minor. The real issue at stake here was respect. NBA commissioner David Stern had made too many ultimatums, issued too many deadlines and given us all the high hat. The players responded by disclaiming interest and filed an anti-trust. This tentative settlement, ten days later, was more of an apology from the NBA than a compromise. The split of Basketball Related Income was set at a “band” of 49-51 percent. This reflects the 50-50 agreement that had been previously reached. One percent will go to the fund for retired players, a nice play by the union and a swell gesture by the owners. Apology accepted. The “Carmelo Anthony rule” was dropped by the owners. This would have prevented players from exercising their Larry Bird contract extension rights in “extend-and-trade” deals like the one that sent Anthony from the Nuggets to the Knicks last spring. It’s very unclear as to why the owners were trying to stop these deals, which amount to a player limiting his own movement in deals that all parties have to agree to. This was never a sensible bargaining item, and not much of concession. Shrugs all around. The OK City Thunder are still stuck with Kendrick Perkins (also an extend-and-trade deal last season). Mid-level Exception (MLE) contracts for teams over the salary cap were set at four years. The owners had wanted to alternate four-year and three-year deals, but what was the point? There’s no rule that says a team has to use its MLE at all. Don’t want a player for four years? Don’t sign him. And how was a team limited to three-year deals going to compete with a team that could offer four? More shrugs at the bargaining table. Sign and trade deals by teams paying luxury tax would be allowed but “limited,” according to reports. Huh? These types of deals occur too rarely to figure out what that means. Qualifying offers to restricted free agents would be raised. Aha. The Bucks had two restricted free agents, Luc Mbah a Moute and Chris Douglas-Roberts. Because they were 2nd round draft picks, their pay scale was low and the Bucks only had to commit $1 million to retain their rights to the players. That’s pretty low risk, especially for Luc, who’s due to get a raise. The Bucks decided not to retain rights to CDR, despite the low financial commit. Raising the qualifying offer would not necessarily drive salary higher for a player like Luc, whom the Bucks want to keep. But it would make it more difficult for teams to restrict players they have little interest in retaining. Freedom! – but not necessarily for players in high demand. The owners conceded on when to assess the Mid-Level Exception (MLE). Teams not paying luxury tax will be allowed to use the full $5 million MLE, regardless of whether, on paper, the MLE nudges the team into tax territory. This keeps any number of improving teams in small and big markets from being penalized as though they were repeat tax offenders like the Lakers and Celtics and Spurs, which is what the owners wanted to do. I’ve wondered why Herb Kohl or any small market owner agreed to this and questioned whether this was a clause to level the playing field for the luxury tax payers, contrary to the owners’ rhetoric about “competitive balance.” If the owners actually conceded on this, I can finally stop blogging about it. “Yessssssssss!!!!!!!!! !” – Andrew Bogut tweeted this morning. “Does the beard and mullet stay or go?” wondered Jon Brockman. “Es finalmente todo esto verdad o sigo soñando ?? ?” That was from Carlos Delfino. This entry was posted in The Jinx and tagged 2011 lockout, Andrew Bogut, Carlos Delfino, David Stern, Jon Brockman, NBA collective bargaining, NBA Players Association on November 26, 2011 by J.D. Mo. The shuttle diplomacy between lawyers for both sides in the broken mess of contract negotiations between NBA players and owners began on Tuesday, continued Wednesday and will resume today on Black Friday. Yahoo Sports columnist Adrian Wojnarowski broke the story Wednesday afternoon, right about the time most anybody with hope for a season had given up looking for NBA lockout news until after Thanksgiving weekend. The talks are aimed trying to resolve differences to the point where union lawyers and leadership can get a handshake deal, re-establish the union, draw up a formal proposal, vote on it and open a 66-game season Christmas Day — a televised feast of showdowns that NBA junkies look forward to every year. The obstacles are many, and go a long way toward explaining why the players disclaimed the union. Poor leadership by union chief Billy Hunter and union president Derrick Fisher. They backed down and down again, all the way to a 50-50 split of revenue, and got very little in the way of concessions from the owners. 30-40 other proposed contract changes by the owners that are still unbargained. While the union wanted to talk about rarely occurring issues such as sign and trade deals by teams in the luxury tax zone, they agreed to park a host of workplace issues such as drug testing, leaving those for later. A lack of good faith bargaining from the owners. Had they wanted to secure an agreement Nov. 14, owners would have agreed to at least one saleable concession that might have given the players reason to approve the deal. Instead, the players saw only smug, insulting press interviews by NBA czar David Stern — who insisted the players vote on a proposal that the union didn’t agree to. No deal. Personal conflicts among the key negotiators. Everybody seems to like union prez Fisher but there’s no love lost between Billy Hunter, union lawyer Kessler and commissioner Stern. 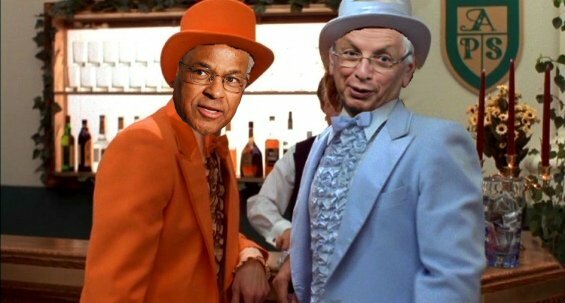 Stern and Hunter may have staved off retirement to negotiate one more deal, but their omni-presence has been a PR disaster for the league. You’d be hard-pressed these days to find an NBA fan who likes the sight of either of them, especially not fans old enough to remember that Hunter and Stern have been around since the 1980s. Kessler’s the bad guy whom Hunter and Stern can blame for the acrimony before they retire on the heels of one more deal. It won’t be true — but if reports that the two sides are making progress without Kessler in the room are true, the lawyer has served his purpose. The double penalty “cliff” proposed by the owners. The Lakers and Celtics and Mavs would lose their full mid-level exception (MLE – set at $5 million, $3 million for penalized teams), and pay a higher tax rate. This reduced exception could be used once every two years. But teams stepping into tax territory for the first time would also be penalized and it would be enforced right away, taking away the full MLE that nudged the team in tax territory. The Memphis Grizzlies or Milwaukee Bucks would be treated like the Celtics or Lakers, albeit paying a different tax rate. Does this benefit competitive balance? It sounds less like something small market owners such as Bucks owner Herb Kohl or Grizzlies (they’d be competitively screwed) owner Michael Heisley wanted and more like a rule that title-contending taxpayers like the Lakers, Spurs, Celtics and Mavs demanded in exchange for agreeing to the double penalty (no – the Heat aren’t paying luxury tax with their roster yet, but this rule will limit what they could pay an MLE free agent). If you’re looking for the one concession that will lead to a contract agreement, the rules on exacting penalties at the edge of the cliff is it. The parties essentially picked up where they left off Nov. 10, discussing a proposal that includes a 50-50 split of revenue, shorter contracts and tougher spending restrictions. The players rejected that deal, but on the basis of a half-dozen mechanical issues which, in the grander scheme, are fairly minor. They have already conditionally agreed to the 50-50 split and most of the new payroll restrictions. It should be noted that the owners have made sure not to be too hard on themselves in these negotiations. The 12% cut to the salary cap and luxury threshold won’t go into effect until the 2013-14 season. And behind all of this has been an agreed-upon amnesty clause that would give teams a one-time “get-out-of-our-worst-mistake” card. The player would be released with pay, of course, but his contract would not count against the salary cap number. Gilbert Arenas (Magic), Baron Davis (Cavs), Mike Miller (Heat) — this means you. For the Bucks that could mean Drew Gooden, whose contract won’t look so tradeable in 2013-14 when the salary cap and luxury threshold would be lowered 12%. To boot, either side could opt out of the previously proposed ten-year deal after six years when a new TV deal will be in place. 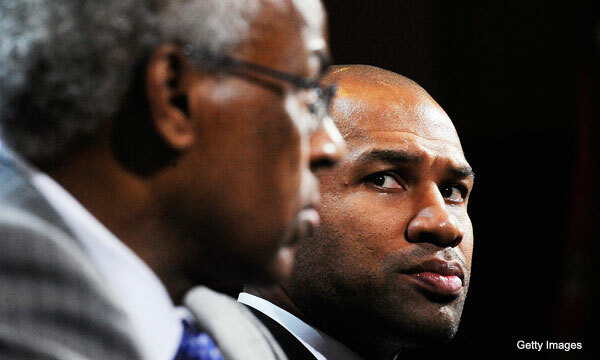 The lawyers have called Derrick Fisher to New York. A deal may finally be in the works. This entry was posted in The Jinx and tagged Billy Hunter, David Boies, David Stern, Derrick Fisher, Jeffrey Kessler, NBA amnesty 2011, NBA collective bargaining, NBA labor negotiations, NBA players lawsuit on November 25, 2011 by J.D. Mo. They gave, gave again and gave back some more, earning little in the way of contract concessions from NBA owners. Something had to give and this time it wasn’t going to be the players of the NBA. The 30 NBA players’ union representatives met today in New York and voted unanimously to file a “disclaimer of interest” notice to the league and its owners, putting an end to a collective bargaining process that led nowhere and had finally broken down. They didn’t really have a choice given the intractability of the league on a number of contract items of debatable importance to parties on both sides. In addition, it was revealed last weak that 30-40 other, “B-list” items remained unbargained, a problem that doomed the latest incomplete league proposal before it was presented. Further rumblings suggested that NBA commissioner David Stern lacked the needed support from owners on the latest proposal. Somebody had to end this mockery to collective bargaining, and that’s what the players did today in the speediest manner available to them. The incomplete and unbargained deal is in the trash. The players union has walked out of the bargaining room for good and will take their chances in the New York branch of* the federal courts. It was the only self-respecting thing they could have done. ED. NOTE: Players filed suit in Oakland, Calif., and Minnesota. The Oakland case was moved to San Francisco Friday. This entry was posted in The Jinx and tagged David Stern, NBA collective bargaining, NBA Players Association on November 14, 2011 by J.D. Mo. Is a deal between NBA players and owners finally brewing? Today was the day. The day NBA commissioner David Stern set as a deadline for the players to accept the owners’ most recent offer or contend with a new, less favorable proposal that cut the players’ share of revenue to 47 percent. The players on Tuesday said they couldn’t accept the owners’ offer, but said they would lower their revenue split proposal to 50 percent, IF … If they could get the owners back to the table to negotiate on other issues, such as the mid-level salary cap exception (the infamous MLE), penalties for big spending teams over the cap and other issues impacting free agent movement. It worked. As of 5:45 PM Central, the two sides have let Stern’s “deadline pass” and are at the negotiating table, talking. (The deadline was 6:00 PM central.) The hope is that they’re doing more than talking and reiterating their positions, and are actually negotiating. If they are — a big IF — today could be the day this lockout ends. The scuttlebutt this week has been that a deal is imminent, and that the threat of a new, harsher proposal from the owners was a ploy to get the players’ moving their offer, and get it moving now. It seems to have worked. Still, I’m sceptical that the owners will move all that much on the free agency issues for big spending teams over the salary cap. If exceptions are allowed (the MLE) without stiff penalties for the big spenders, what’s the point? And if small market owners such as the Bucks’ Herb Kohl are serious about competitive balance, what’s the point of fining, say, the New York and Los Angeles teams? That would put money in small market pockets but wouldn’t necessarily impact play on the court. And to a man, regardless of market, NBA owners have money to burn. 6:05PM Central … they’re still talking. Contrary to some reports, the NBA’s most recent offer is still on the table. This entry was posted in The Jinx and tagged David Stern, NBA collective bargaining on November 9, 2011 by J.D. Mo. It’s come to this. The NBA owners and players will meet later today to try one more time — not to get a deal — but to make significant progress in their negotiations on a new Collective Bargaining Agreement (CBA). There is no rule or law that says there has to be a work stoppage. Both sides could continue on under the old CBA while they work to forge a new one. The players won’t strike, and won’t even take the owners to court so long as the two sides are talking. And the owners don’t have to lock the doors. The best hope right now is that the owners decide they’d rather keep talking than lock the doors after a fantastic NBA Finals that set TV ratings records (in the cable age, at least). There was an informal vote taken in the players’ meeting last Thursday in New York, where an overwhelming majority of the room insisted they would go the distance with the union. The owners want rollbacks on existing contracts, a hard salary cap and provisions that make owning and operating a profitable franchise a paint-by-numbers enterprise. The NBA and union will meet one final time on Thursday before a lockout comes on July 1, and there are many on the players’ side who wonder why they’ll even bother. “Just look at the proposal the owners have made: How do you expect anyone to respond to that in good faith?” agent Mark Bartelstein said. “It’s laughable. GMs around the league have acknowledged that to me. Every GM has acknowledged that there’s nowhere for the players to go with what’s been proposed by the owners. Maybe the agents should shut up and stay out of it. But their bread is buttered by the continuation of business, so what well-minded agent would stay out of it? They have a role and they certainly talk to more of the league’s GMs than I do. But I can say with strong confidence that I’ve been involved in more collective bargaining negotiations than most sports agents. These days, employees do not get locked out. The workforce doesn’t walk out and set up a 24-hour picket. While the two sides in almost every contract negotiations negotiate, business continues until the differences are sorted out. The NBA, of course, is not going anywhere. And its employees (the players) are not going to strike. So our best hope is that the owners realize that their product is better now than it’s been in over a decade, that the American and worldwide audience has registered and verified its interest in the product, and that business should continue while progress is being made. It’s the American way these days. It works. It works every time. Now we just need to see enough progress today to ensure that the owners see the folly of shutting down the game, even for a little while. This entry was posted in Essential Reading, The Jinx and tagged David Stern, NBA collective bargaining, NBA lockout on June 30, 2011 by J.D. Mo. We’re still working hard to emigrate the Bob Boozer Jinx archive over to its new home here at BobBoozerJinx.com. The corporate directors have even decided that it’s OK for me to take a break and go watch the Super Bowl. Before I head out for an evening of football, I do have to make an important announcement regarding the P.O. box to which you’ve all been sending beer money. If your mail has been returned “undeliverable”, this was due to an administrative error in setting up the box, not because the P.O. box was yet another hoax perpetrated by yours truly. Seems that although you and I still get mail from previous tenants at our homes and apartments, postal service will not deliver mail to unregistered “tenants” of a P.O. box. Who knew? Well, I do now. Point being, said problem has been fixed — it is now safe to resend all that beer money that the post office returned to you. And safe to send more! Bogues, I hereby solemnly swear to use this donation in the spirit in which it was given by drinking Foster’s or other Australian beer while watching your Bucks. Bogut led the Bucks with 21 Saturday despite being slowed by the migraine. By now Pacers coach Jim O’Brien should be a convert to the Bogut All-Star crusade: In the Bucks first game vs. the Pacers, AB led the Bucks with 31 pts, 18 rebs and 3 blks. That’s an average of 26 pts and 13 rebs vs. O’Brien’s Pacers this season (Bucks are 2-0). With another victory over the Knicks Friday, the Bucks went to 5-1 vs. the Knicks since Scott Skiles became Bucks coach and Mike D’Antoni took over in NY. The Skiles Bucks have never lost to D’Antoni’s Knicks when Bogut suits up. This time, AB played only a few minutes in the first quarter and hit all three of shots before leaving the game with one of those migraines that cripple him at least once per season. Ouch. The Knicks really don’t like to play defense, and that starts with their coach and his run-and-gun philosophy. It’s fun to watch but worked best when Steve Nash was running the D’Antoni show. Remember that D’Antoni was fired in Phoenix in large part because his no-D system failed time and again to get the Suns through the West playoffs. Labor-management strife. Looks the owners are going to play hardball with the next collective bargaining agreement. Much of what’s being said now is probably posturing. Some of it, however, is probably not. Like Commissioner Stern’s “middle finger,” as one NBA executive put it. This entry was posted in The Jinx and tagged Andrew Bogut, David Stern, Indiana Pacers, Mike D'Antoni, Milwaukee Bucks, New York Knicks, Scott Skiles on February 7, 2010 by J.D. Mo.